Local hydrponic stores sell tubing that you can direct out of your main tube from the central pump and this distributes water from the fish tank into the top bottles so the water can trickle through the system. We used 5/8" tubing for the main and 1/4" for the feeders. Black is best, to keep algae from cloggin the system. The tubing is connected with little, sharp connector fittings that you push into the main tube. We got these at our hydroponics store, but they are standard drip irrigation items. 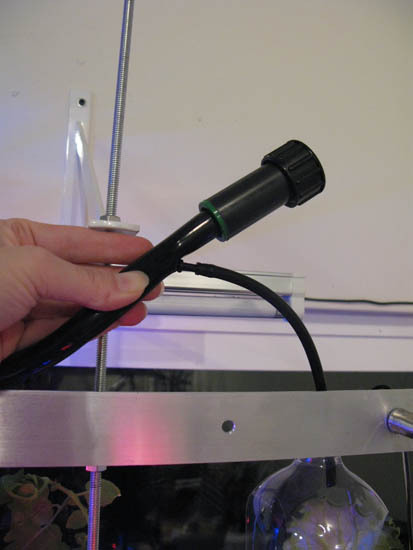 A small drill bit can create a small opening for the smaller tube and this flexible system allows you to customize the placement of your smaller tubes to fit your Farm Fountain. The plug on the end of the larger tube was also purchased at our local hydroponics store.